What is a gloss treatment for hair and hair color? 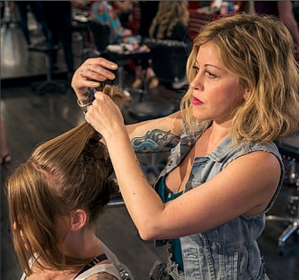 Crimson Stylists are hairstyle and color expert who are leaders in the beauty industry! 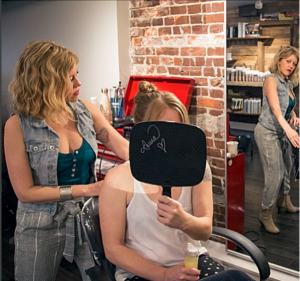 We has seen her clients go through changes in both their life experiences and their looks. Clients who never dyed their hair when they first started with us may become interested in covering up gray hairs that are springing up, but are hesitant to start with coloring and changing their look too much. Should I get a gloss treatment? This is where gloss treatments come in: Gloss Treatments work to blend gray hair away, without applying an all-over color to change hair’s look. The demi-permanent dye is subtle and natural, a perfect first step in changing your salon experience needs. Gloss Treatments add shine! They are conditioning and contain protein for strong and glossy strands. Gloss Treatments blend grays away, covering them inconspicuously with demi-permanent color. The color washes away gradually, between 14 – 16 washes depending on your shampoo. Gloss Treatments wash out and won’t leave your roots showing. Fight frizz with a gloss treatment; the creamy conditioning smoothes the hair shaft.